The Spokane River flows 111 miles from Lake Coeur d’Alene, Idaho, to Lake Roosevelt, which is the Columbia River impounded by Grand Coulee Dam. The lower 29 miles of the Spokane River is known as the Spokane Arm of Lake Roosevelt. The river basin is about 2,400 square miles in size. The Spokane has three major tributaries: the Little Spokane River and Hangman (also called Latah) Creek, both in the Spokane area; and Chamokane (also called Tshimikain by the Spokane Tribe of Indians) in the lower part of the basin. The Spokane River Basin includes parts of five Washington counties — Pend Oreille, Stevens, Lincoln, Spokane, and Whitman — and three Idaho counties, Benewah, Kootenai, and Bonner. For the Spokane Tribe of Indians, the river has been “a pathway of life for many, many generations,” according to tribal publications. Members of the tribe have relied on the river for nourishment, medicinal, and spiritual purposes. Spokane Falls was a place for tribal members to gather with family and friends. The Spokane River and the Spokane Falls are in the heart of the ancestral homelands of the tribe. The Spokane Indian Reservation borders the north shore of the river from the confluence of Chamokane Creek at river mile 32.5 to Lake Roosevelt. Historically the Spokane was a salmon river, and the Spokane Tribe of Indians was a salmon-fishing tribe. Three distinct groups of Spokane Indians lived along the river, the “upper” Spokanes resided from Post Falls to the base of Spokane Falls just west of present-day downtown Spokane, the “middle Spokanes resided from the Spokane Falls to the Little Falls reach of the river, and the “lower” Spokanes resided from Little Falls to the confluence with the Columbia River. All fished for salmon, and some of the fish they caught were among the biggest in the entire Columbia River Basin. True June hogs spawned in the Spokane River Basin — Chinook salmon that returned from the ocean in the early summer and often weighed 80 pounds and more. The Spokanes were not able to participate in negotiations of Indian treaties with the federal government in 1855. The importance of salmon was so great that the Tribe could not attend the 1855 treaty negotiations in the Walla Walla Valley, or the eventual signing ceremony, because the timing, in late May and early June, conflicted with salmon fishing in the Spokane River. As a consequence, the Spokane Indian Reservation was established by Executive Order in 1881 by President R.B. Hayes with no mitigation or mention of rights or access to salmon fishing outside reservation boundaries. There are seven dams on the Spokane, from Post Falls Dam at the outlet from Lake Coeur d’Alene to Little Falls Dam at river mile 29. All have hydroelectric generators. One, Upriver Dam, is owned and operated by the City of Spokane Water Department, and the others are owned by Avista Corp., an electricity and natural gas utility based in Spokane. The dams were built between 1890 and 1922. None has fish-passage facilities. Little Falls Dam, completed in 1911 at river mile 29, stopped the fish from returning farther upstream. The dam was built with a fish ladder, but it did not work well. The much larger Long Lake Dam, completed in 1915 five miles upstream, had no fish ladder. Salmon continued to spawn downriver from Little Falls Dam into the late 1930s, when Grand Coulee Dam, then under construction, blocked all salmon and steelhead from the upper Columbia River Basin. Before Little Falls Dam was completed, the Indian fishery in that same area may have been the most important on the river, attracting more than 1,000 people and yielding as many as 800 fish per day. Indians from other tribes, including the Coeur d’Alenes and Colvilles, also participated in the fishery. The Little Falls site was one of 11 primary Indian fishing sites along the river prior to construction of the dams. Indians typically trapped fish in weirs in the river and then speared them. Sherwood also testified that before Little Falls was built at least five species of anadromous fish went up the river — summer Chinook; fall, winter, and spring steelhead; coho, and a small silver fish that could have been sockeye or mountain whitefish. Steelhead, coho, and sockeye (or whitefish) spawned upriver from the dam. Chinook spawned in the main river channel both upstream and downstream from the dam. 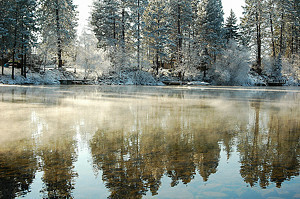 Today, the Spokane Tribe works to protect and improve water quality and fisheries for tribal and non-tribal benefit. The tribe works collaboratively with area agencies to monitor the fish population, fish habitat, water temperatures, oxygen levels, pollutants and the day-to-day water quality. The Spokane Tribe owns and operates a fish hatchery that produces kokanee and rainbow trout for release into Lake Roosevelt. The hatchery, built in 1990-1991, was developed and constructed as partial mitigation for the loss of salmon, steelhead, and habitat caused by hydroelectric dams, particularly Grand Coulee The hatchery is open for public tours during the week. More information about the Spokane Tribe is on the tribe’s website. More information about the Spokane River is in the Council’s Intermountain Subbasin Plan and in a 1985 report prepared by the Upper Columbia United Tribes Fisheries Center entitled, Compilation of Information on Salmon and Steelhead Total Run Size, Catch and Hydropower Related Losses in the Upper Columbia River Basin, Above Grand Coulee Dam.